Your angels walk with you, and in difficult moments gently guide you on your path. When you forget that you’re always guarded, guided, and protected you will be reminded by this exquisite ring. 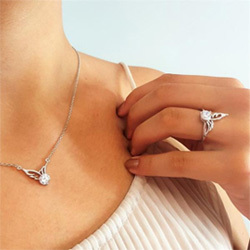 Its elegant, flowing design and sparkling angel wing as its centerpiece are a tribute to your strength and the ever-present love and support of those who watch over you. Wear this ring and allow its stunning beauty to remind you that you are always looked after. Made the right choice purchasing this! Love it. I absolutely love my rings that I have gotten so far ! They are really beautiful. I love this ring. Ordered it as a reminder my daughter is an angel now. I really love this ring. It is just right...not too small and not too large. Its a great everyday wearing ring. Another beauty! I purchased two Angel rings at the same time because I couldn’t decide which one I liked better. I am so glad I did! This one is beautiful and fits perfectly! I will definitely be placing another order! Love this ring. Fast shipping, good quality, already made a second purchase!And when I shared the picture with my aunt she had a friend who bought one too! Another satisfied purchase. Love it! Service is superb. Very nice to wear seeing I just lost my son to cancer. I really love my ring and the earrings too. Ring fit perfectly. Looking forward to wearing them both this weekend. I hope to order more items in the future. Beautiful piece in remembrance of my Mom. I love it. It is very elegant, and I have had so many compliments. Gifts for my daughter, she loved them!!! Love how this looks on. Have received nice compliments. I love my new ring. I think of my loved one every time I look at it, and know he is with me in spirit. I love this ring. It fits perfectly. O have gotten many compliments on it. I love wearing the ring, it is a great reminder that Angels are watching over me. This one I bought for my sister-in-law in remembrance of my brother. She live out of town so I have not given it to her yet but I'm sure she will like it. I love it, It is very pretty in person. Got lots of compliments. Very pleased, will be ordering more in the future. I love the ring! Just wish you had smaller sizes. Purchased this ring in remembrance of my Mom and Dad both Angels in heaven. The ring fits perfectly and the design is simple but elegant. Love it! Beautiful and so far very happy. Helps me get through the tough days-just a glance at my finger and I have my angle with me. I will buy again nice ring. It was perfect. It was given as a gift and it was a hit! Love this ring. Fits perfectly and looks great. I fell in love with this ring as well as the other ring I received, beautiful, outstanding and I can't wait to wear them both and show them off. Love the ring. It's exactly what I had been looking for. My younger sister and I share a special bond and like to have matching rings. I got this ring for the both of us and we were very pleasantly surprised. The picture just doesn't do it justice. It it absolutely gorgeous and of good quality. We will definitely look into your other products in the future. Thank you! I love my ring, I know I have my Angel with me. The ring fits perfectly with my other rings. I had to wait a while to get the ring so that was a little disappointing but Henry V in customer service was very helpful. The ring is very pretty, good quality and fits great. I love the ring. I bought a necklace from here several months ago and it is still beautiful so I know this ring will last also. The ring is beautiful! I love it! I love my ring and bracelet, it will be something i will wear almost every day in remembrance of my Mom! Just recieved it, so far really like it . Bought this in honor of my Dad. It comforts me every time I look at it. Thanks. I purchased this ring in memory of so many loved ones lost. I believe strongly of Angels. This ring will carry my thoughts to my loved ones on Angels’ wings.